Microsoft finally unveiled its new 10-inch tablet with the new name “Microsoft Surface Go“. It’s over three years since the company released the Microsoft Surface 3 on May 5, 2015. In this new generation, it has much better features than its predecessor, including the new 10-inch PixelSense display with a higher DPI of 217, double performance, new 165° full friction kickstand, Windows Hello support, Surface Connect port, and a more rounded edge design. Every Microsoft Surface PCs also comes with a recovery partition easy for you to reset your Surface back to factory settings if you needed. However, in case you can’t reset your Surface Go with the existing recovery partition or it doesn’t exist anymore, you can use a recovery drive instead. 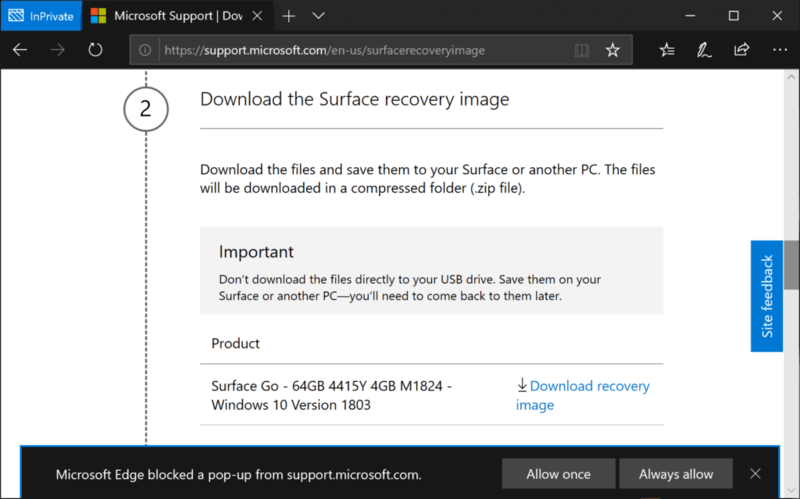 To create a recovery drive, you will need to have the official recovery image specifically for your Surface Go model. 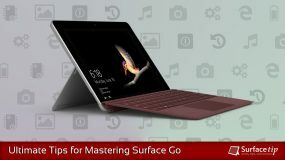 In this tutorial, we will walk you through step-by-step how to download the right recovery image for your Surface Go. 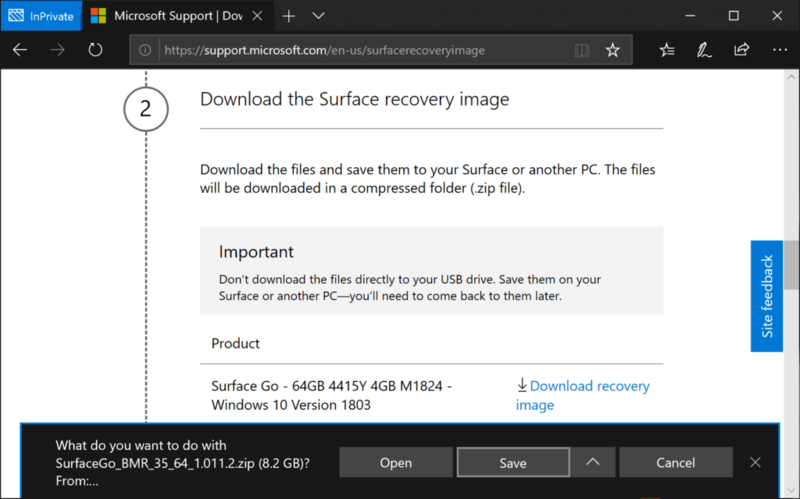 There are two pieces of information that need to know when you want to download a correct recovery image for your Surface Go. Serial number: 12-digit number located under the kickstand. 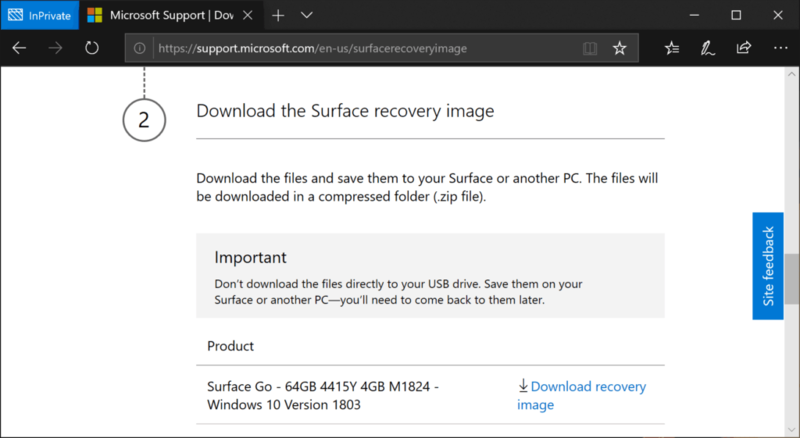 Now you need to visit download a recovery image page on Surface support site. 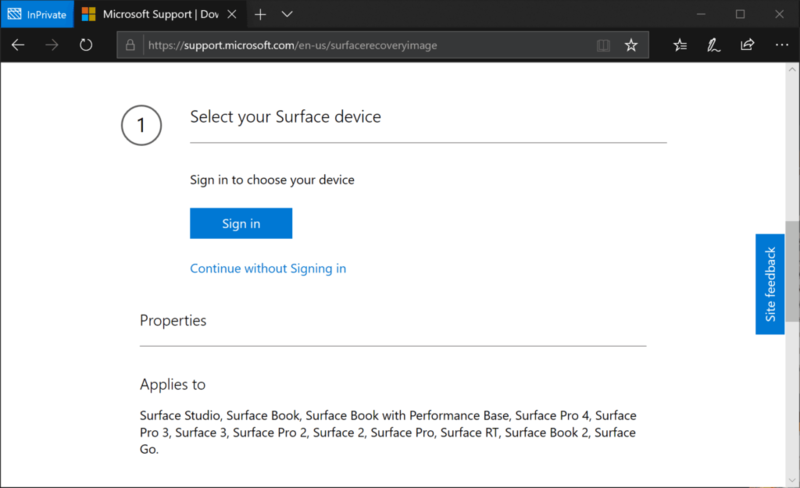 To download Surface Go recovery image without Signing in. Click Continue without Signing in from the options above. 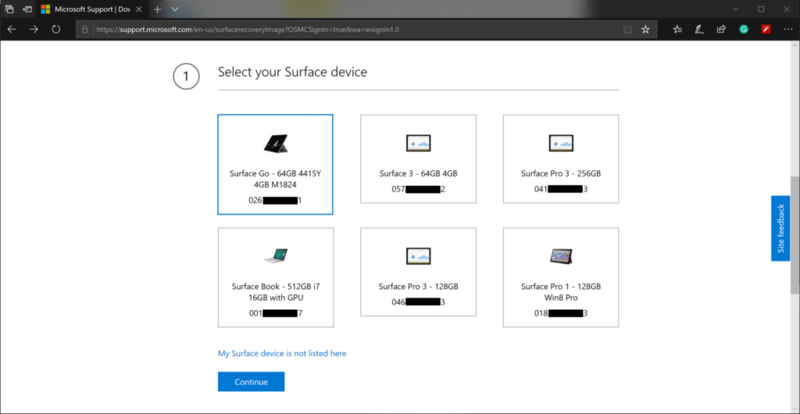 Select Surface Go, and enter your device’s Serial number. Then click Continue. If you type a correct serial number, it will show up a correct version of recovery image made specifically for your device’s model. Click Download recovery image. Click Save to start downloading. By default, it will be saved to your computer’s Downloads folder. 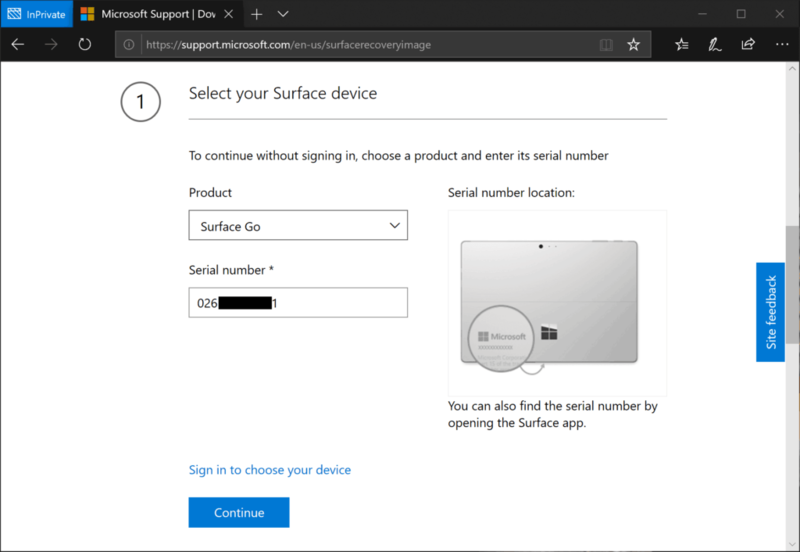 If you have already registered your device with your Microsoft account, you can use this option to quickly download the image without retyping the serial number again. Click Sign in, and sign with your Microsoft account. Select the device you want to download from the list of registered devices, and click Continue. Now you can download by just click on Download recovery image. Microsoft Edge: Make sure you allow pop-up requested from the site when you click download. Click Always allow. Google Chrome: Make sure to notice the pop-up blocking notification in the address bar, Allow the pop-up request and try to download again. 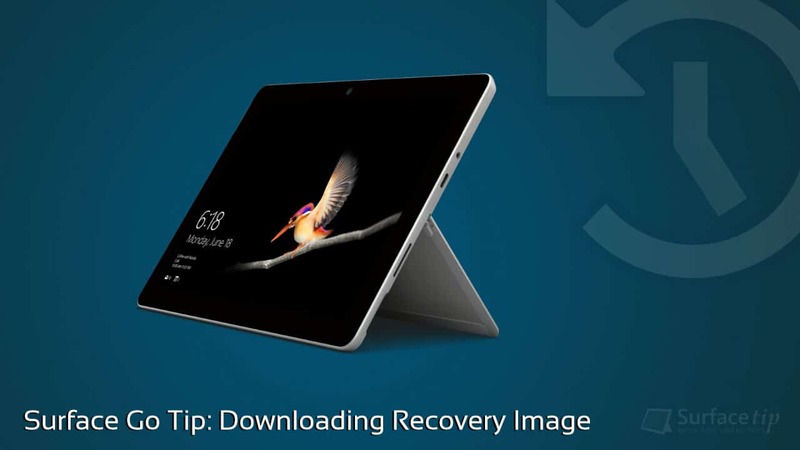 We appreciate hearing your thoughts, questions, and ideas about “Surface Go Tip: How to download the official recovery image”. Please post respectful comments and on topic. We will be replying back to you as soon as possible. Share your idea about "Surface Go Tip: How to download the official recovery image".